Enter Nathaniel Mass, a senior fellow with the consultancy of Katzenbach Partners and managing director of N.J. Mass Associates, an investment-banking and advisory services firm in New York. Mass has devised a metric to help finance executives make more-informed spend-or-cut decisions. Known as the relative value of growth (or RVG), the metric compares the amount of shareholder value a company creates through revenue growth with that generated by margin improvement. In theory, this helps managers align their decisions more closely with investor expectations and create more shareholder value. "RVG measures the economic incentive for a company to grow versus reduce costs," says Mass. The apparent trade-offs between revenue growth and profit margin may lead managers to assume that additional amounts of either yield about the same gain in shareholder value. RVG reveals the difference, which is why Mass insists such a metric is needed. What's more, the former McKinsey consultant argues, this measure shows that growth and margin are by no means incompatible, dispelling another misconception he says too many managers share. Mass goes so far as to suggest that RVG can enable financial managers to spot flaws in their strategies, target their investments, and cut costs more effectively, down to the level of specific products and services. To compute RVG, it is necessary to estimate the average growth expectation of a company's shareholders. 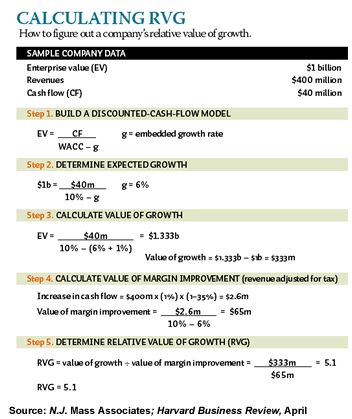 Mass does that by establishing a discounted-cash-flow model, essentially an equation in which one side equals a company's enterprise value (market capitalization plus the value of outstanding debt) and the other equals its sustainable cash flow divided by its weighted average cost of capital (WACC) minus investors' growth expectations, where the only unknown is those expectations. Once Mass solves the equation and arrives at the company's expected (or "embedded," in Mass's parlance) growth rate (EGR), he can apply that to the company's revenue to calculate the enterprise value of one additional percentage point of cash-flow growth. Next, Mass calculates the enterprise value of a one-percentage-point improvement in margin by dividing the additional cash flow that improvement would produce by the difference between the company's WACC and its EGR. Finally, he creates a ratio of the two values, dividing the amount that one percentage point of growth produces by the amount one percentage point of margin produces (see "Calculating RVG," below). Generally speaking, the higher the ratio of the two, the more a company should emphasize growth, and the less it should seek cost savings — and vice versa. With an RVG over 2, you can think about growth strategies. Consider, for example, RVG's application to Procter & Gamble's 2004 results. Based on the company's enterprise value of $157 billion, 8 percent WACC, and $5.6 billion in sustainable cash, Mass finds that P&G would gain $53 billion in shareholder value from a one- percentage-point increase in revenue, versus $7.35 billion in extra shareholder value produced by a one-point gain in margin. The former is 7.2 times more shareholder value, so P&G's RVG is 7.2. Sure enough, Mass observes that P&G's recent turnaround program was focused, contrary to conventional wisdom, more on improving growth than on cutting costs. P&G's recently approved $57 billion acquisition of Gillette is illustrative. Granted, at 3.1 percent, investors' growth expectations are a full point lower for Gillette than for P&G. But thanks to Gillette's strong cash flow and margins, its RVG is 10.4, more than three points above P&G's. So by Mass's calculations, P&G would create an additional $20 billion in enterprise value by improving Gillette's growth by just 1 percent, which he contends won't be difficult given P&G's superior marketing muscle. That additional value is equal to four times the premium that P&G paid for Gillette. On the other hand, RVG can also help warn executives to pull back on growth initiatives. With a 2004 RVG of only 0.7, for example, Electronic Data Systems Corp. can add $1.45 billion to its market cap by boosting its operating margin by one point, or it can settle for a $1 billion gain by increasing revenue growth. That suggests, according to Mass, that EDS shouldn't spend heavily on growth before it has improved its operating margins and cash flow. Indeed, new CEO Michael Jordan has been cost cutting despite criticism from analysts that EDS's industry, enterprise computer services, offers good growth potential. In 2004, in fact, the company embarked on a $3 billion cost-cutting plan that included the elimination of about 20,000 jobs with the heady objective of raising its margin from 1.1 percent at present to 8 percent by 2007. Mass uses standard financial metrics to calculate RVG. Yet some experts believe that he combines them in a uniquely valuable way. One fan, Steven Wilber, a principal in the Jenison, Michigan, office of ROCG Americas Consulting, cautions that it is particularly important to use sustainable cash flows in the equation. That means ignoring, as Mass does, boosts from working capital effects and the like. (Not that working capital improvement isn't useful, as our article "Capital Ideas" explains.) By focusing on sustainable cash flow, Wilber argues, the formula won't allow managers to slash such items as capital expenditures and thereby "cut their way to success." Others contend that RVG isn't entirely original. Brent Wortman, a partner in Deloitte & Touche, likens it to the DuPont model — a system developed in 1919 by a finance executive at E.I. du Pont de Nemours & Co. and still used today. That model projects future value based on revenue growth, operating margin, and asset turnover. But Mass insists he's using such metrics in a new way, pointing out that margin, capital intensity (or asset turnover), embedded growth rate versus cost of capital, and the synergy of two or three of those elements combined are the key drivers of RVG. Mass also reassures those who worry that growth strategies often demand trade-offs in profitability. "RVG does not assume growth at any cost; it assumes growth at existing margins," he points out. For this reason, the numerator in RVG should be understood to reflect risk. Because RVG is only about 18 months old, few finance executives are familiar with the metric, and even fewer want to wager an opinion as to its value. But they might want to familiarize themselves soon. Pfizer Inc.'s 7.5 RVG in 2004, for example, raises questions about its strategy. While the company is in the midst of a three-year restructuring and cost-cutting initiative aimed at saving $4 billion per year by 2008, CFO Alan Levin says the goal is to free up cash to reinvest in research and development, as well as new-product launches. But an RVG as high as Pfizer's suggests that the company needn't have cut costs so aggressively, depending on whether the driver was a high EGR or a low cost of capital. While RVG does not address dividends or buybacks explicitly, Mass notes that companies with ratios above one or two should be looking to invest in growth before returning capital to shareholders. The opposite is true if shareholder expectations are inflated, because neither spending nor cost cuts may add value in that case. In addition, growth tends to be elusive, even for companies with double-digit RVGs. Robbert Van Batenburg, head of research at Louis Capital, empathizes with managers of companies that have high RVGs. "If attaining growth were simple, all companies would aim to improve [it]," he says. Mass couldn't agree more. Implementing and executing growth strategies, he admits, "is always easier said than done." That's apparent in Nathaniel Mass's recent application of his RVG methods to the banking industry for the New York consulting firm of Katzenbach Partners. (See our cover story, "Secrets of the M&A Masters," for a longer discussion on acquisition strategy.) Large banks, he found, do sport high RVGs, but that is primarily due to a low cost of capital plus very strong cash-flow margins. In fact, their embedded growth rates are dismal. For example, while Bank of America's RVG approached a whopping 18 in 2004, its embedded growth rate registered only 1 percent. Bank of America's EGR would have been 7.6 percent if based only on the revenue that the bank added from acquisitions. The company acquired $14.2 billion in revenue from the purchase of Fleet Boston Financial and $515 million from that of National Processing. But because banks haven't enjoyed much synergy from acquisitions after paying significant acquisition premiums, investors discounted that additional revenue far more heavily than they did the bank's organic growth, which was expected to fall short of 3 percent. Other banks showed similar results. The RVGs of both J.P. Morgan Chase and Wachovia exceeded 14, but their EGRs lagged at only about 2 percent. "Most investors don't pay for acquired growth unless they get margin improvement," says Bear, Stearns & Co. analyst David Hilder. He notes that for large banks, "there is no linear relationship between an increase in scale and an increase in efficiency." — M.L.